Lawmakers plan to avert a shutdown at the end of the week with a two-week stopgap measure, giving the fight over border wall funding a new deadline. The stopgap will last two weeks, bumping the deadline back from Dec. 7 to Dec. 21, according to two congressional aides. While House Democrats preferred a one-week measure, they won’t object to a unanimous consent request for a two-week measure, a Democratic aide said, adding that the measure will extend all the expiring provisions that were included on the last continuing resolution (Public Law 115-245), such as the Violence Against Women Act. President Donald Trump said over the weekend he may support a two-week stopgap measure for agencies that aren’t funded for fiscal 2019, delaying a potential partial shutdown until after services for deceased former President George H.W. Bush. That would cover the Treasury, Justice, Commerce, State, Interior, Transportation and Agriculture departments, among others. The two-week spending measure would need the consent of all Republicans and Democrats in the House and Senate because the House plans no roll call votes this week, the aides said. While the measure would avert a shutdown Friday night, lawmakers and Trump don’t appear any closer to an agreement on border wall funds, and there’s no consensus among negotiators how long they should continue to rely on stopgap measures. Senate Minority Leader Chuck Schumer (D-N.Y.) said last week he’d support a continuing resolution funding the Department of Homeland Security for the rest of fiscal 2019. That would deny Trump his requested boost in border wall funds. Trump has asked for $5 billion, while Schumer has said he’d go as high as $1.6 billion for border security barriers, though some Democrats in Congress say they oppose any funds. A meeting among Trump, Schumer and House Minority Leader Nancy Pelosi (D-Calif.) scheduled for tomorrow has been postponed at least until after Bush’s Wednesday funeral services. “I think there’ll be a CR that continues to kick it until the Democrats are in control,” Rep. Mark Meadows (R-N.C.), chairman of the House Freedom Caucus, told reporters last week. While a continuing resolution would technically provide $1.6 billion for the border wall by keeping funds at fiscal 2018 levels, those funds couldn’t be used to replace current fencing with a wall, Meadows said. “I see that as zero,” Meadows said. Trump wrote on Twitter this morning that he doesn’t plan to back down from his demands for border wall funds. Could the Other Six Bills Advance? The Homeland Security spending bill is holding up six other measures: Agriculture-FDA, Commerce-Justice-Science Financial Services, Interior-Environment, State-Foreign Operations, and Transportation-HUD. Lawmakers are split on the viability of a plan to pass all the other measures and fund Homeland Security in the long-term with a continuing resolution. Meadows said conservatives wouldn’t likely support such a plan. Rep. Tom Cole (R-Okla.), a senior appropriator, said he hopes lawmakers pass as many spending bills as possible, minimizing the number of agencies and programs funded with a stopgap. Rep. Mike Simpson (R-Idaho), another senior appropriator, said he wants to see all the seven remaining bills passed as soon as possible. “A CR is a bad way to fund government,” Simpson said, because any increases or decreases in funding levels for programs that appropriators agreed to earlier in the year don’t go into effect, meaning many programs will be over- or under-funded. “So it’s just, a CR is a terrible way to fund government,” he said. Trump this morning criticized recent levels of spending on national security, indicating he may want to decrease defense spending in the future. The figure Trump cited covers all national security spending, not just Pentagon funds. Trump has previously touted his efforts to build up the military and even said he’d continue to push for high levels of defense spending, though possibly slightly lower than fiscal 2019 levels. 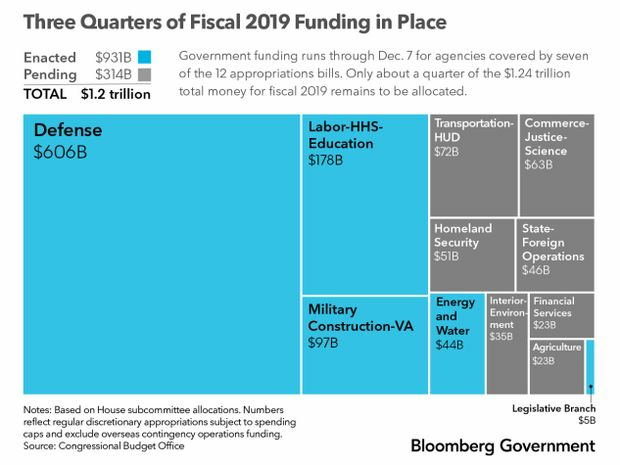 In October, Trump said during a Cabinet meeting he wants $700 billion in national security funds for fiscal 2020, which would exempt the Department of Defense from his request for 5 percent spending cuts from all agencies. The Senate Appropriations Energy and Water Subcommittee postponed a hearing planned for Wednesday on advanced nuclear reactors. The post Lawmakers Plan Two-Week Stopgap, Delaying Border Wall Standoff appeared first on Bloomberg Government.